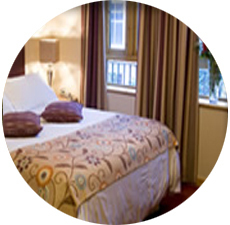 The Kingfisher Guest House in Dublin City Centre makes it a perfect base from where to explore the city. 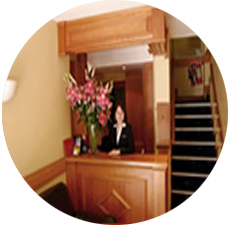 If you are planning to come to Dublin on business or pleasure, our city centre location just 60 yards from O'Connell Street (which is the main street in Dublin) makes the Kingfisher Guesthouse the perfect base from which to explore the city. The warm pastel shades of our guestrooms are both refreshing and relaxing in contrast to the cooling effect of the pine fitted furniture. The self-contained guest rooms are all en-suite with TV/video, safe, hairdryer, tea/coffee making facilities, and most with fitted kitchenette. 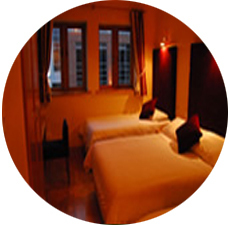 Triple rooms have either one double and one single bed or three single beds. A selection of award winning breakfasts is served in our air conditioned restaurant, famous for its fresh seafood, homemade chips and prime fillet steaks. We now also have an exclusive new wine bar where you can sample wines from across the world. Also new to the Kingfisher is a state of the art Cyber-caf and phone booths for those keen on surfing the web and need easy access to cheap phone calls. The Kingfisher is located minutes from all major shopping centres, art galleries, pubs, the Gate Theatre and Virgin and Savoy cinemas.